If you’re one of the millions of people across the world that suffers from light sensitivity, it’s a good idea to invest in a quality pair of sunglasses. Photophobia, migraines, and a slew of other conditions can make menial tasks a challenge. Sufferers experience pain and sensitivity from a variety of light sources, including bright computer screens and even the sunshine on a bright summer day. While sunglasses may seem like the obvious solution, not every pair is designed for eye sensitivity sufferers. In fact, most designers and manufacturers create sunglasses to appeal to the broad and fashionable masses rather than those who need them most. A few companies have stepped forward to help people regain control of their lives and step out into the light. Specially designed sunglasses help control the amount of light that penetrates the eye, relieving migraines and sensitivity. 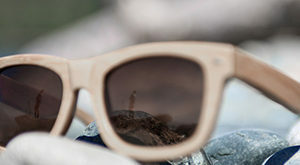 The technology goes far beyond normal polarized lenses to deliver better performance and comfort in a stylish package. Here are the 5 pairs of fashionable sunglasses for those who suffer from migraines and photophobia. This pair of modern sunglasses from Axon Optics is specially designed for migraine sufferers. It eliminates pain caused by light by filtering out certain wavelengths. Clinical testing has shown that the lenses are effective in eradicating the light that triggers pain. The lenses are in a stylish unisex frame. It’s brown for easy outfit matching and lightweight enough to wear all day. There are two versions available. One is designed to make it more comfortable to see indoors in front of computer screens while the other is designed for outdoor use. Additional anti-glare and smudge coatings are also available. These sunglasses were carefully tested to filter out the offensive light. Made by MigraLens, they are designed to filter out blue and red light, which causes pain and sensitivity. The treated lenses are green in tint and help reduce the intensity and duration of a headache. Once a headache starts, putting these glasses on will help soothe pain and prevent light from further agitation. It is approved by the Migraine Action Association, so you can rest assured that it is effective. It’s made for both men and women. The wrap around design is comfortable and effective in covering the entire eye. If you’re looking for protection from indoor fluorescent lights, this pair from TheraSpecs is the key. It is in a retro aviator style featuring a metal frame with a gold matte finish. The large lenses cover the eye completely for maximum relief. The pinkish-orange lens blocks out harmful light from fluorescent bulbs, making it perfect for office and computer use. If you plan on using it outside, the tint will provide protection in overcast weather. The lenses also block 100% of UVA and UVB rays. The pair of sunglasses are incredibly stylish for use anywhere and come with a microfiber bag for easy transport. These glasses from MigraLens provide heavy-duty protection when you need it most. It’s considerably larger than other sunglasses, but will easily fit any face. The ends of are rubberized for a secure fit while the sides are flexible enough to contour around the head. The large lens provides complete coverage. Even the sides contain a lens to cover peripheral vision. In terms of protection, the lenses are designed to block red and blue light for photosensitivity relief. The green tint will reduce the severity of a headache and help shorten the duration of pain. Like the previous glasses from MigraLens, these are approved by the Migraine Action Association. From TheraSpecs comes this stylish and modern pair of protective lenses. Designed for indoor use, they protect from fluorescent light and harsh artificial lighting from computer screens or tablets. The lenses have a unique tint that filters out the offending wavelengths in the lights spectrum. The frame is made from metal with a dark nickel finish. It also has nose pads for prolonged comfort throughout the day. If you step outside, your eyes will have 100% UVA and UVB protection. However, they aren’t made to protect from the extreme light of the sun. It’s more effective on light indoors or outside on overcast days. Eye sensitivity is fairly common. Light can affect a person’s eyes and body a variety of different ways. However, more serious sensitivity conditions exist, making it difficult for sufferers to live their lives normally. Photophobia refers to unusual eye intolerance to light. It is caused from a range of medical issues and external factors. Some also have it from birth. Sufferers may experience pain that ranges in intensity depending on the light source. Sunlight is usually the most common type of light to affect the eyes. It can result in pain, watering, and the inability to keep the eyes open. Migraines are another problem associated with light sensitivity. While photophobia can affect people without migraines, it’s more prevalent in those that suffer from them. In fact, light is often a migraine trigger. A simple reflection of intense light can cause migraine pain to begin, even if there weren’t any signs prior to the light. Most migraine sufferers are also very photophobic, experiencing pain regardless of whether or not they have a migraine. While the easiest thing to do would be to avoid light in general, it’s simply not possible. The best way to manage sensitivity is to be proactive. By wearing sunglasses regularly, you can avoid the problems that come with photophobia. It’s a good idea to invest in quality sunglasses that can be changed out based on your location. If you’re inside, you need protection from artificial lighting. This includes wearing safety sunglasses every time you use a computer. When outdoors, it’s crucial to wear sunglasses that offer complete UVA and UVB protection. This helps avoid potential damage to the eyes. Darker lenses will block out more light while polarized coatings help avoid glares and unnecessary reflections. When you’re photophobic and suffer from migraines, normal sunglasses won’t do. You need special sunglasses that provide ultimate protection against all kinds of light. You should choose sunglasses based on the protection and comfort they provide. A variety of different color lenses are available. While they may seem like a cosmetic choice, different colors can change the way light travels to the eye. In fact, people react differently to different colors. Generally, red and blue light is triggering to migraine sufferers, so a lens that filters those colors out will help provide relief. Additional coatings can make a pair of sunglasses more versatile and protective. Polarization is a common coating that eliminates glare by reducing scattered light. More advanced coatings take polarization and step further by affecting light on any reflective surface. Photochromic coatings are also great, as they adapt to changing light conditions. While there is no permanent cure to photophobia and migraine pain, there are ways to manage it and live a normal life. Quality sunglasses are available to relieve pain caused by sensitivity. They will filter out light to provide protection, even on the brightest days.